Audiron primarily harmonizes the channels of three burners and large intestine , however, most of all their side branches that go through the places where otitis media and herpes occur. Disharmony of the aforementioned channels shows itself by certain symptoms such as some hearing disorders, tinnitus, swellings behind the ears, inflammations, and a number of other complaints that are related neither to ears, nor to a mouth. The preparation contains vitamin E, a unique composition of seven plants, bio-information and essential oils well known for their anti-inflammatory, anti-microbial, anti-bacterial, and anti-viral effects. It may be used for otitis media, herpes, and other complaints, but also for routine cleaning or ears after bathing. Otitis media is quite a common complaint, mainly among children. Considering a relation between upper respiratory system and a middle ear, otitis media occurs as a complication of a cold or influenza. Children suffer from otitis media more often than adults because their auditory tubes are shorter and narrower, so germs can get easier from the nose to the middle ear. Besides the swelling of a mucous membrane can lead to a temporary closure of the Eustachian tube causing accumulation of secretion in the middle ear. This way is created an exudate that is a feeding ground for germs. Course of disease : it starts as a cold, then suddenly occur pain in the ear and fever. In case of babies and small children that are not able to identify a painful place themselves yet, we have to consider a possible case of otitis media if a child is restless. Moreover if it is accompanied by a fever and a child keep touching his/her ear. Herpes simplex is a viral infection, often repeating and attacking mainly cheeks, lips and an area around the mouth, buttocks, or other places of the body. Preceded by the burning feeling, groups of vesicles of various sizes erupt. The vesicles dry out and their content creates scabs that heal herpes without leaving a scar. Eruption of vesicles is provoked by fever, sun bathing, in some cases psychological reasons such as shock, etc. Treatment of herpes is not problematic. It always heals itself. However, it is difficult to prevent the recurrence. In this sense we recommend a regenerative cure using the syrups of pentagram as a prophylaxis. The nature gives us the efficient weapons from the worlds of plants and minerals that have been used by the mankind since time immemorial to help in various health complaints. Some of them are used in the Audiron preparation. Geranium robertianum: since the times of ancient Greece have been used the astringent qualities of this plant for swellings and all types of wounds. It contains tannins, malic acid, citric acid, and phenol with an antiviral effect. Plantago lanceolata: contains potassium, calcium, germanium, which is an element with strong anti-mycotic effect, further also enzymes, slime substances, vitamin C, and silicic acid. Topically is applied on oozy eczema, non-healing wounds, and ulcers. Symphytum officinale: also contains anti-mycotic germanium, calcium, allantoin, flavonoids having antioxidant effect. It soothes inner bodily surfaces, speeds up healing of wounds and bones, and regenerates tissues. Eupatorium cannabinum: is used in treatment of influenza accompanied by muscle ache, malaria, and nasal catarrhs. It has strong anti-viral effect, invokes perspiration, and helps overcome high fever. It contains flavonoids. Tropaeolum majus: contains a natural antibiotic that is effective against 46 strains of Staphylococcus bacteria and also other strains even in the lowest concentration. There could be found also substances containing sulphur that have antiseptic effect. Aesculus hippocastanum: increases the resilience of blood vessels and is used for inflammation, tonsillitis, and vascular disorders of the brain, swellings, and eczema. It contains aesculin that is ten times more efficient against unicellular organisms than chinin. It helps decrease fever. Sanguisorba officinalis: has distinctive astringent, antiseptic, and anti-inflammatory effect. It inhibits bleeding and decreases fever. 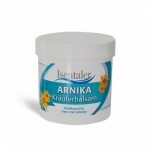 It is used in treatment of tonsillitis, and healing of wounds and ulcers. It contains flavonoids, anti-bacterially acting substances, and is effective against protozoan. Apple vinegar: has strong healing and anti-mycotic effect and is applied topically for various inflammations, herpes, fungi, and infections. It contains high volume of mineral substances. It alleviates pain and removes itching. Myrrh oil: has distinctive antiseptic, astringent and anti-inflammatory effect. It alleviates the pain in wounds and ulcers, soothes inflammation of mucous membrane, facilitates healing and has tranquilizing effect. Geranium oil: has healing, anti-depressant, and antiseptic effect. It is used for sore throat, inhibits creation of scars, and stimulates the adrenal gland. It is applied topically on shingles and thrushes. It tonifies the whole organism. Vitamin E: facilitates healing and granulation of the skin. It has antioxidant and anti-mycotic effect. Amber: is a fossil resin of coniferous trees that was formed approx. 50 million years ago. It is used in treatment of various infectious diseases. It decreases fever and stimulates the function of thymus gland. Rose quartz (SiO 2 ): this sort of quartz with a dash of manganese dioxide has antiviral effect. It has a positive effect on mental state, function of CNS, and hypophysis. Malachite (Cu 2 (CO 3 )(OH) 2 ): is an alkaline copper carbonate hydroxide that has anti-inflammatory, analgesic, anti-bacterial and anti-microbial effect. It is a general-purpose remedy and is used mainly in the Oriental Medicine. Chalcedony (SiO 2 ): varies in color very much. Its use varies very much, too. It has antiviral and anti-bacterial effect, and a positive influence on the regeneration of cells and a number of vital processes in our body. Andradite (Ca 3 Fe 2 [SiO 4 ] 3 ): has anti-bacterial and antiviral effect. It has a positive effect on the lymphatic system and decreases high fever. 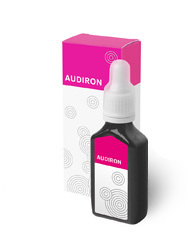 For regular cleaning of the ears apply several drops of Audiron on a swab and clean in regular way. In cases of otitis media make a cotton swab sufficiently soaked in Audiron, then apply 1 – 3 drops of Audiron directly into the ear and easy insert swab into the ear. When the swab dries out, repeat the whole procedure. If there is no improvement within several hours, then it is necessary to consult your physician. Audiron may be used together with the preparation Vironal. In cases of recurrent otitis media we recommend a regenerative cure using the syrups of the pentagram . Combined use with the Energy info-cosmetics. Audiron has proved its worth also in the treatment of many other complaints. For herpes and some types of warts apply it on the affected area several times a day. Moreover, herpes may be treated also with the preparation Cytovital . In cases of skin problems consult your physician. Further Audiron may be used together with the Artrin cream for the strained collarbone insertions and shoulder muscle insertions , for pain in upper arm . Audiron together with the cream Droserin may be used for the swellings behind the ears , swellings of throat , or in cases of cervical spine blockage . 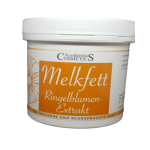 For mycotic diseases of the skin , mainly on feet, apply together with the cream Protektin . For skin inflammations , tinnitus, hearing impairments , and to improve the hearing of older people we recommend using Audiron and also Korolen, Renol , or King Kong . 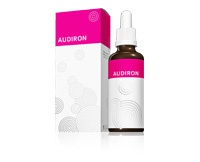 Audiron may also be used for toothache when it is applied on a cheek in the area of pain together with Artrin and Cytovital . The course of the large intestine channel and the area of application of Audiron and Droserin in the case of cervical spine blockage.